5-13 April Assamo was mostly in any around the town of Ali Sabieh in southern Djibouti, just north of the Ethiopian border. 14 April he was in the town of Ali Adde in the morning, then near the road going into Ethiopia, close to the border. 15 April he made a quick trip into Ethiopia on the road north of Denele, but then by later that day he was a couple of km south of Arta (in the map above, this is the small cluster of locations just south of the Gulf of Tadjoura. He stayed there for the whole of the 16th and 17th, mostly near the road. 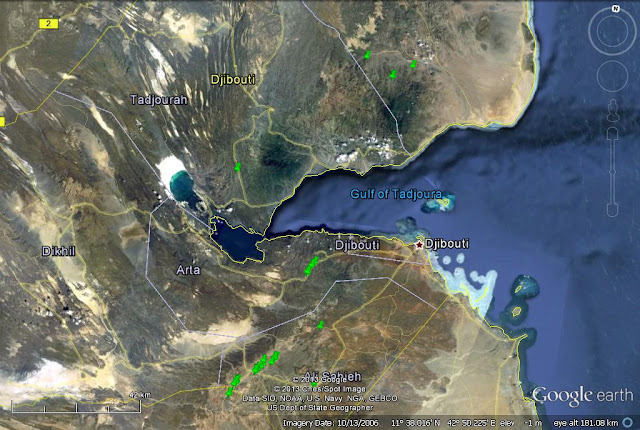 18 April at 0715 in the morning he was already north of the Gulf of Tajoura, and by 1015 he had covered the 60 km or so to a location about 32 km NE of Tadjoura town and NW of Obok. I don't know about you, but I find this fascinating!